If you have studied about the Old Testament "Tabernacle in the Wilderness" you know what an important study it is fulfilling many types and lessons about Christ as revealed in the New Testament. For example: In the O.T. 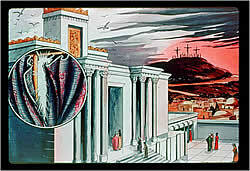 Tabernacle, there was a 15 foot high veil that separated man from God except once a year on the "Great Day of Atonement." The O.T. High Priest entered through that veil into the Holy of Holies, once each year to obtain temporary atonement for the sins of the people. The N.T. says of Christ: "Neither by the blood of goats and calves, but by His own blood He entered in once into the Holy Place, having obtained eternal redemption for us." (Heb. 9:12) (Note: "having obtained" is past tense.) IT IS DONE! Christ FINISHED the work of paying for our sins. Later that O.T. method of worship was incorporated into the Temple in Jerusalem. Matt. 27:51 tells us that when Christ died on the cross, that veil which had barred man’s access to God was "RIPPED IN TWO – FROM THE TOP TO THE BOTTOM." Remember, it was 15 feet high. Man did not rip it - GOD DID! Man’s access to God was no longer barred. The O.T. "Tabernacle in the Wilderness" study can help to strengthen the faith of believers in God’s Word and the Lord Jesus Christ. It can also help to bring unsaved people to the understanding of WHO Christ is and WHAT He did for us on the cross, which has helped many trust HIM 100% for their salvation. We highly encourage you to study it and teach this to others. If you have the Microsoft® "Power Point Program" or the free "Microsoft® Power Point Viewer" on your computer, you can see this Power Point Show. And using a Video Projector you can show and teach it to large groups. 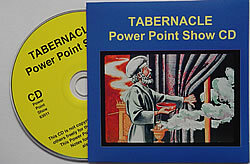 This Tabernacle Power Point CD has 44 full color slides for your study and teaching. For those who cannot or prefer not to download this Tabernacle Power Point Show, or who cannot burn a CD from the downloaded show, you can order it here already on a CD. Churches may want a quantity of these CD’s for Bible Teachers, S.S. Classes, home Bible Classes and missionaries. They can all freely download the associated PDF “Notes and Study Guide for Students and Teachers.